My addiction to beads has not abated as I went into a haberdashery shop for some interfacing a few weeks ago and came out with some Japanese glass beads which were being sold cheap due to a stock clearance. This was the first time that I had ever been in this shop, too afraid to go again! So before opening the packets it seemed a good idea to use some of my existing beads, I have also been asked to make some earrings and a matching pendant, but instead of doing that I found myself making all these! Unfortunately this has not even made a dent in my bead stock pile, so will just have to go on making more. Oh nearly forgot to say this is Jane's winsome earring pattern with a little adaptation. 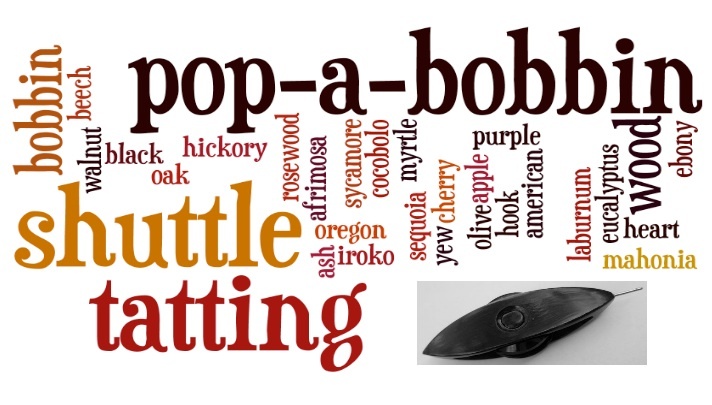 Tomorrow the latest batch of pop-a-bobbin shuttles will be on sale in Jane's Etsy shop. It will be 12 midday BST when they are set free! Someone asked if we had any shuttles made from Olive Wood, we do now! 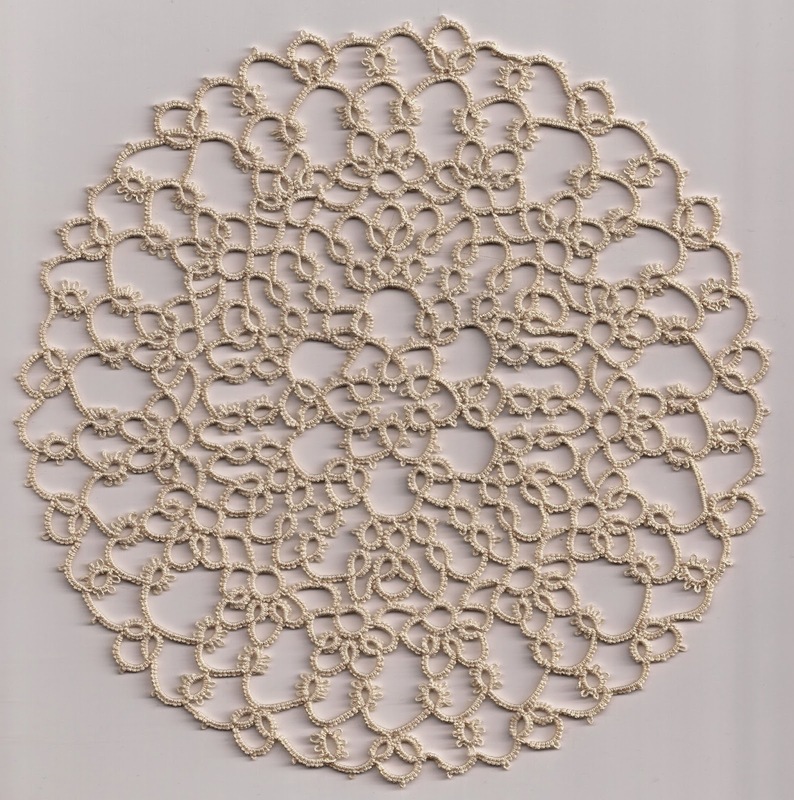 And yes I am still tatting the second of Renulek's Spring doily which I started. There will be quite a few shuttles for sale in Jane's Etsy shop next Saturday, amongst them will be some flat shuttles made from Ash and Sycamore. I have also pyrographied patterns on them and the points of the shuttles could be used as a picot gauge as the marks are graduated. There are also some new woods in this batch, here is one of them - spalted beech. We think the markings were caused by the tree at some point being diseased. Last year a tree outside one of the churches shed a few branches in the storms. Whenever this happens the Vicar rings me up so that we can go and collect the wood as soon as possible. The branches came off a giant sequoia tree and as you can see the wood is really red in the middle and the shuttles have a pinkish tinge. Anyway go over to Jane's blog tomorrow to hear more about all the shuttles that will be for sale. A day which is supposed to herald the beginning of Summer, although officially it is a bit early and anyway it is dull and raining outside at the moment! It is a time of May Pole dancing. Dancers move around a large pole stuck upright in the ground, moving their ribbons either in a web around the pole or by plaiting it to the pole itself. To unravel the ribbons, the dancers retrace their steps. Clever if it works but it doesn't always! So as I have missed working with buttons for quite a few months I decided to make these crosses. The pattern is by Lily Qualls Morales but her pattern used size 10 thread and these are 20 so I just added a few stitches. The three crosses are lying across a branch that I orginally brought home to use as an Easter decoration, but it never happened! In some parts of Britain, 1st May is called Garland Day, when young girls used to make garlands for their hair.